Is this the new Honda Gold Wing? Spurgeon and I decided an article on the “leaked” 2018 Honda Gold Wing and F6B was completely necessary to inform you, our readers, of this juicy, juicy tidbit. Only one thing stood in our way: Lance. He insisted that articles need to have, you know, facts or whatever. We disagreed. In order to pass Lance’s stringent requirements, we agreed to pen an actual analysis, and not just water-cooler gossip like little old biker yentas. We think this is probably a legitimate redesign by Honda, and, to get our story published, we dug up just enough information to support our half-assed theories. 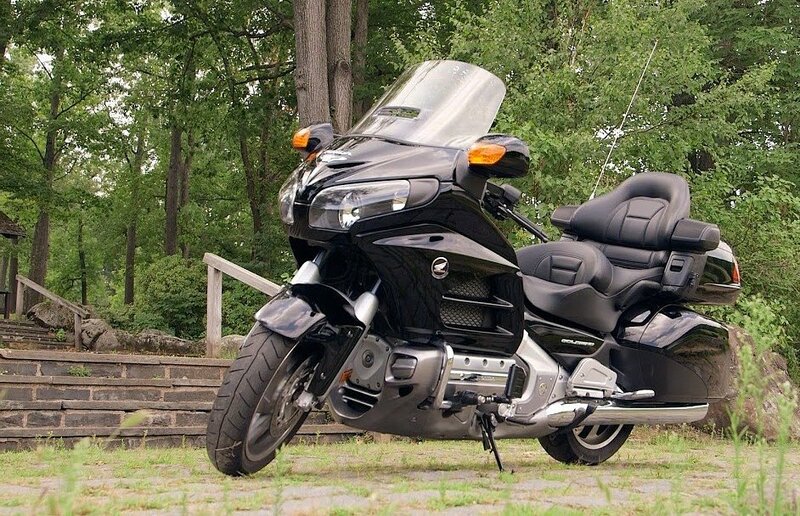 There is a lot to glean from these photos about what to expect from the new Gold Wing. Photo presumably from Honda Motor Company... Perhaps. First, let’s look at these photos. We think the redesign appears plausible enough. 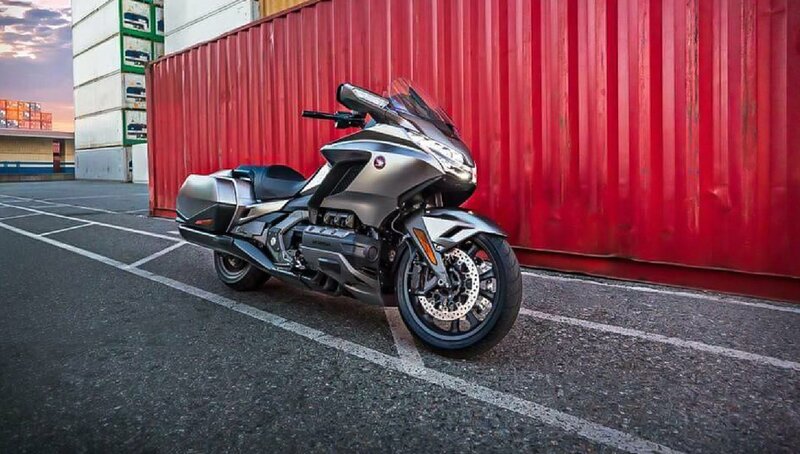 The front looks sportier and sleeker, the rear bags have a bit more definition to them, making the back of the Gold Wing and F6B look a little less like a 2003 Ford Taurus. Next, consider the electronics scenario. Gone are the hard buttons that littered the Gold Wing’s lower fairings. Instead, we now see a small, central cluster of buttons that are presumably soft controls for menus presented on the (new) color display. So far, so good. Yamaha made a big push with their new Venture and Eluder, which are packed to the gills with tech, and BMW’s K 1600 GTL and K 1600 B (which we’ll have a video review on shortly) are also upping the electronics game in the touring market. It would completely stand to reason that Honda is also investing heavily in that area. The new Duolever-style front end would be a departure from Gold Wings of past. Photo presumably from Honda Motor Company... If we were betting men. Now we’d like to take a second and point out what I feel may be the most crucial evidence of all: the Hossack-style front end. For those of you who are uninitiated, this is the same style marketed by BMW as their “Duolever” setup. (You may notice another competing publication has referred to this as being similar to BMW’s Telelever. It’s not. It’s much closer to a Duolever.) This front end effectively acts like a car utilizing a double-wishbone suspension. The big claim to fame on this style of front end is the ability to remove the front-end dive that occurs from heavy braking. Chassis off of BMW's K 1600 line. BMW photo. Note the leading link front end at the front wheel. Photo by Greg Gjerdingen. Another reason it makes sense is because Honda has produced a few fruitcake front ends. Soichiro’s C70 Dream back in 1956 sported a leading-link front end. Honda also patented a Hossack-style fork not long ago, so this all fits in nicely together. Is it the same one? We have no idea. But how many Hossack designs is one company gonna patent? And, of course, there was the Honda Rune, with a trailing-link front end, another strange design that is quirky and unconventional ─ but it worked, like many unorthodox things Honda has done over the years. The design aesthetic of the Honda Rune can be called a lot of things. "Stagnant" is not one of them. Photo by Reg Mckenna. Which brings us to another piece of evidence that probably supports this being a real change: Honda has been described as stagnant recently. On a personal note, we don’t agree with that, but the company has seemed to acquire a reputation as ultra-conservative. (Which is kind of funny. This is the company that used oval pistons, built a transverse V-twin, threw VTEC into a motorcycle, and built a self-balancing motorcycle, but those are other articles for another time.) Throwing an unconventional-but-effective suspension setup into the mix on the Gold Wing allows it to be better, but still keep much of the look and performance the bike is known for. Also, the Gold Wing has had a reputation for headshake problems for years, and everyone knows it. A heavy bike relying on antiquated caged ball bearings is already starting behind the eight ball. This new fork design may be just the ticket to solve the problem and silence the naysayers. This looks to be exactly what we would expect from a stock Honda press photo. Photo presumably from Honda Motor Company... We're assuming. Finally, these shots look staged and well-edited. As guys who shoot (and are shot) on bikes, this is not easy nor inexpensive to do. These pics are very similar to items we find in our press kits for all types of new motorcycles. We’re betting that this is completely above-board, and we’re also expecting to be riding about on one of these bikes soon. The only mystery left to solve is if these photos were leaked or “leaked.” Honda loves press as much as any other OEM. Perhaps they realized they could assign a story to Spurg and I by dumping a few photos for us to find.